TFBoys' 'Go!AMIGO' Is A Summery Slice Of Pop Propaganda In China, the song of summer is by a boy band who cleverly promotes communist values to a fanbase that is mostly composed of kids in rural cities. 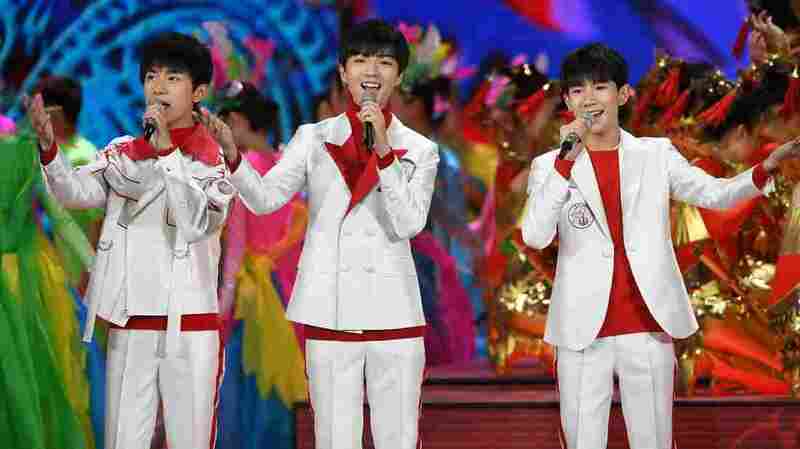 Chinese boyband TFBoys' song "Go!AMIGO" is a big hit in China this summer. The first words of the hit song "Go!AMIGO" are sung in three languages: English, Spanish and Chinese. Its music video shows the three teenage members of TFBoys – China's hottest boy band – gathering friends for a game of baseball. It all seems pretty innocent. But there are calculated reasons behind the song's linguistic flair, the video's focus on baseball and even the band itself: "This video is proof that Communist Party propaganda is evolving," says cultural critic Zhu Dake, who teaches at Shanghai's Tongji University. He says the TFBoys are the latest example of a pop group engineered by a company whose aim is to champion the values of China's Communist Party. The "TF" in the band's name shares an acronym with Time Fengjun, a Beijing entertainment company that selected the boys for the group, writes its songs and produces its videos. "This video is interesting," says Zhu as he watches the video for "Go!AMIGO." "It features baseball, a sport we don't play. It's American, so it's aspirational. But the song's message is about teamwork and serving the collective — communist values. Usually, China's state propaganda is filled with dreary platitudes concocted by government workers with low IQs. But this is very clever." "We rely on each other," the TFBoys sing in "Go!AMIGO." "It's so magical to have you along the way. We'll soon reach our glittering dreams." TFBoys fan Ren Jiaying, a 16-year-old high school junior, says the song speaks to her. Attending Chinese high school is full of pressure, she says, and the band's music reminds her that she's not alone. "They're the same age as me, and I feel like they're with me no matter what I do," she says of the members of TFBoys. "I'm not good at chemistry, but then one day I saw a video of them reciting periodic tables between photo shoots. I feel like we're making progress together." Ren is among tens of millions of young fans who follow the TFBoys' social media feed religiously. It's an enormously popular feed: When bandleader Wang Junkai posted a note to fans on his 15th birthday to Weibo, China's Twitter-like social media platform, it was shared more than 355 million times – the most of any Weibo post ever. Zhu says most of these fans live in the hundreds of cities that make up rural China. "Kids in big cities like Beijing and Shanghai dream of leaving China for America or Europe — they don't care about this kind of band," says Zhu. "But rural kids won't ever get that chance, so this song provides them with dreams of playing a foreign sport in a modern, fashionable China. But who's going to play baseball with them?" Zhu points out that other TFBoys songs — including a modern revamp of the 1960s communist classic "We Are The Heirs Of Communism" — show how the band is being used to promote the government's agenda. Gao Ling, the 31-year-old manager of the TFBoys' Shanghai fan club, admits the band is promoting communist values to young people in a new, fashionable way. "But Chinese society is like this," Gao says. "We need to support our government, and these boys have been taught to be patriotic in school, so they naturally promote communist ideals. There's nothing wrong with going with the flow – that's perfectly normal. They're showing a positive and bright path. They would never criticize society or government." That's because, Gao points out matter-of-factly, "China doesn't yet have freedom of speech."